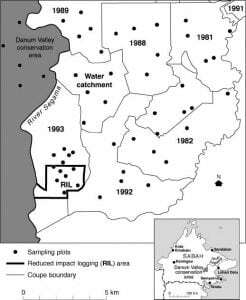 Finding forest plots 2 decades on….. Ever wondered how hard it is to find your way back to the same point in a tropical forest after 20 years? The STEED/Carnegie project team does……. and it isn’t easy! 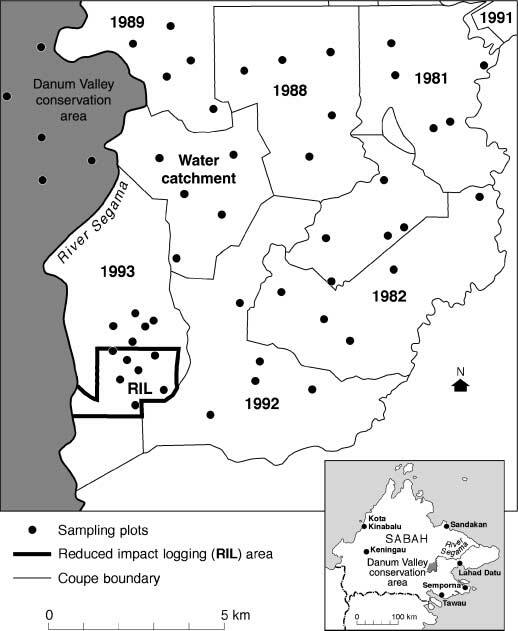 In 1995/96 the EU-funded INDFORSUS project (Developing ground and remotely sensed indicators of the sutainability of tropical forest exploitation systems) established 52 plots in logged and unlogged forest areas around Danum Valley, Sabah, Malaysia (see map below). 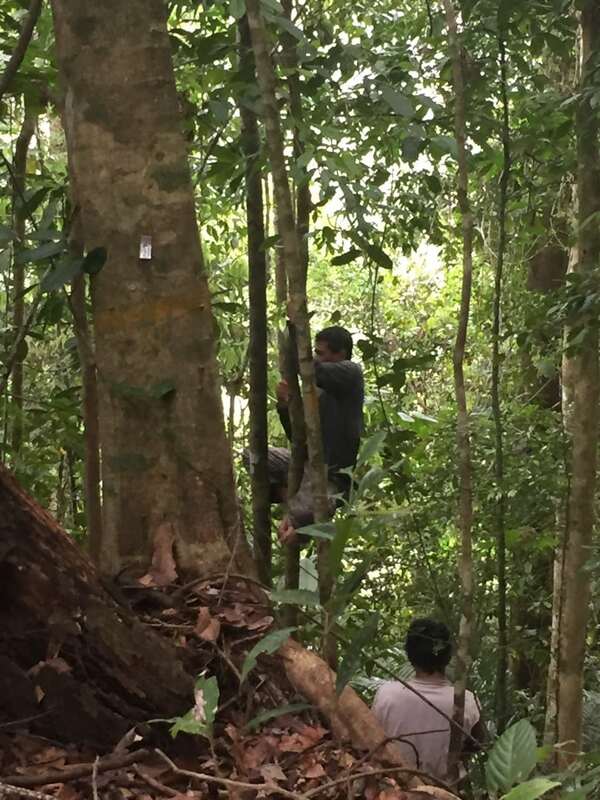 In each of these 0.1ha plots all trees, saplings and seedlings were measured and tagged, creating a valuable baseline dataset in disturbed and pristine Dipterocarp dominated forests. 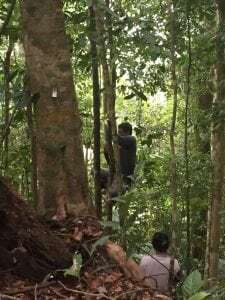 Working on the ground in Dipteraocarp forests around Danum Valley. Research initially funded by the Carnegie Trust for the Universities of Scotland, and now by NERC through the STEED project, is re-surveying these plots to establish change in forest biomass and tree species diversity over the last 20 years, as well as the impacts of the current ENSO event. In particular, we hope to address questions relating to the resilience of these forests to logging, disturbance and environmental / climate change. However, the forest has changed a lot in the last 20 years: logging roads, skid trails, and landslides have all had an impact upon moving about the forest. What was once easy by 4×4 now becomes a long hike or even helicopter ride to access different parts of the study area. 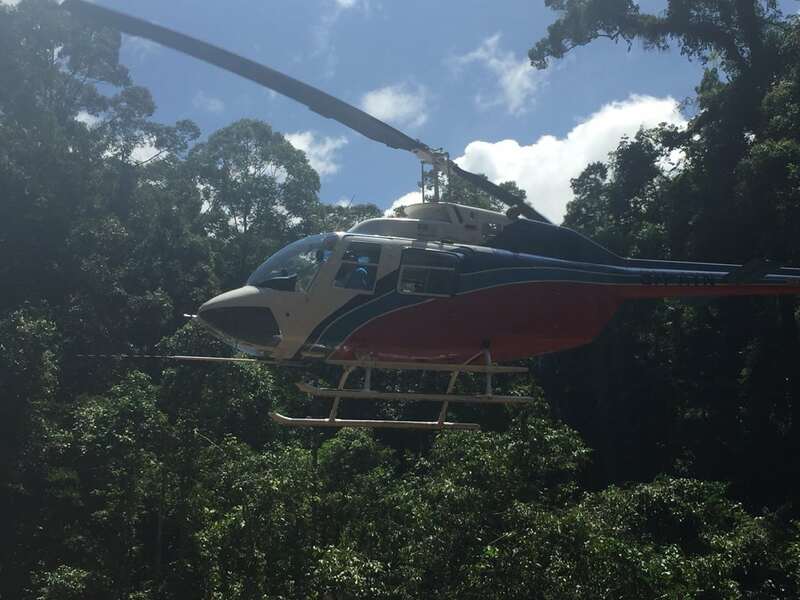 A helicopter from SabahAir being skillfully piloted into a tight spot to drop off supplies for the STEED field team. Not only that, once you get there you have to find the plots. Although tagged, many ‘permanent’ markers on the trees and marking the centre of the plot have vanished – eroded, decomposed or even absorbed into the bark of the tree! Many plots were originally located by walking on a bearing for a set distance through the forest from a GPS point fixed in a clearing – sometimes many 100s meters away. Locating the plots some 20 years later has been a major exercise in itself. Luckily though, we have the fantastic SEARRP Research Assistants on hand to help! 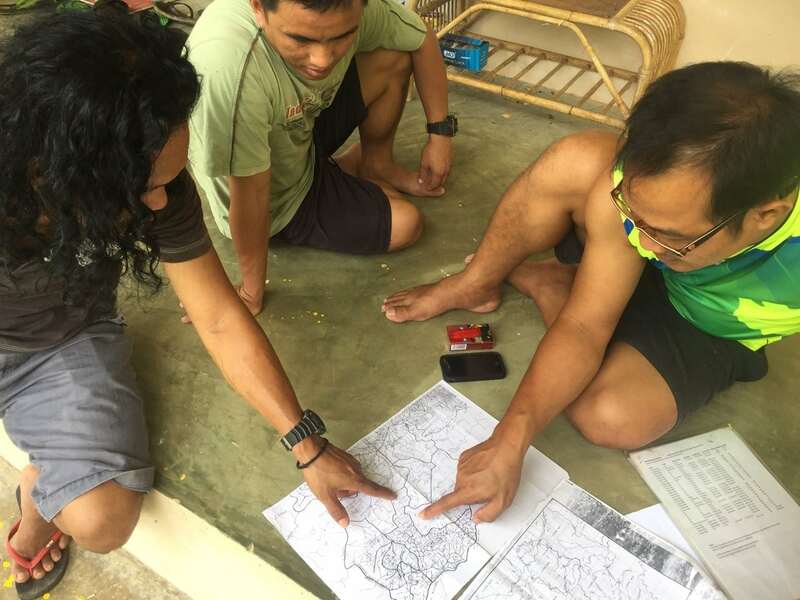 Working with the most basic of maps, the RAs are skilled at working in the forests around Danum Valley. By walking on a fixed bearing they have found some plots, but more often have done so by walking to the general area and then recognizing key species that were recorded in the original survey: by referring then to plot maps of trees that were growing 20 years ago it has been possible to reestablish the location of almost all the original plots. Some of the field team of SEARRP Research Assistants debating the location of the INDFORSUS forest plots. How helpful is the map?? The fieldwork is led by Dr Christopher Philipson (University of Dundee & ETH Zurich) and almost all plots have now been revisited. Currently the team are undertaking a leaf trait campaign looking at the response of trees to the recent drought….but more on that later. 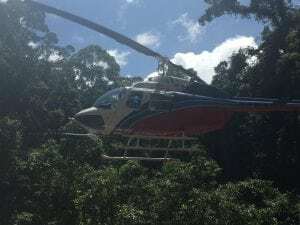 This entry was posted in Uncategorized and tagged remote sensing, SEARRP, STEED Project, Tropical Forests on October 24, 2016 by Mark Cutler.